In your LightArrow app, the Secure Your Data view allows you to set a passcode lock for your app, which provides extra security. In addition, some areas of the app that contain sensitive information require a PIN to see it. For example, if you plan to enter bank and credit card account number information in your LightArrow app, you should make sure that you specify a PIN in this view. In addition, if you set up lockers in the Bookmarks + Lockers topic, it’s required that you set up a PIN. Military Grade 256-bit Advanced Encryption Standard (AES) encryption is included for sensitive data fields. This applies to PINs and account numbers in bank account detail, as well as for storing the password lock and secret question answers. In your LightArrow app, by default, the entire number for each financial account is not displayed. But on each view that contains that information, a lock is shown to allow you to reveal your private data. When you tap the lock icon, you are prompted to enter your PIN. In the Bookmarks + Lockers topic, the app will ask you to enter a PIN to reveal private data. Refer to Bookmarks + Lockers to learn more about lockers. If enabled, passcode locking prevents unauthorized access to your app. If the passcode lock feature is not enabled, go to Settings -> Secure Your Data. Turn Passcode Lock to the ON position and tap Yes. Change the passcode as described below. Set a passcode timeout as described below. Modify security questions as described below. When you return to the Secure Your Data field, tap Save. You must set a passcode before setting a passcode timeout. The passcode timeout specifies how long the app will run in the background before the application is locked. Go to Settings -> Secure Your Data. Type the number of minutes you wish to set the timeout as. The default is 1. 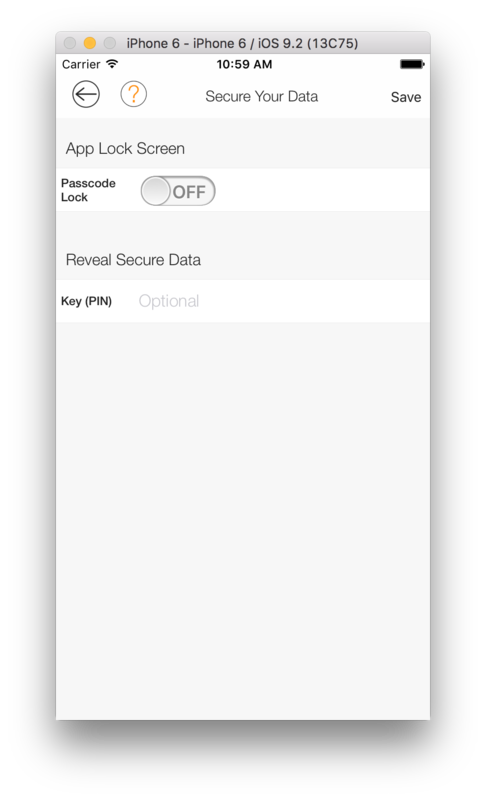 Type any combination of numbers, letters, or symbols in the Passcode and Re-enter Passcodes fields (they must match). Set a security question and security answer in case you forget your passcode. You can enter up to four security questions (each one is asked until an answer is provided correctly). If you plan to enter bank and credit card account number information or use lockers in your LightArrow app, you should make sure that you specify a PIN by following the procedure below. Tap Key (PIN) and type any combination of numbers, letters, or symbols.